Aretha Franklin, Patti Labelle, Celine Dion, Santana and numerous other artists have called upon Jeanie Tracy’s immense talents to participate on their projects. Born in Houston, Texas and raised in Fresno, California, Jeanie Tracy’s singing career began from a very early age in her local church choir. Jeanie took part in “Sing Mahlia Sing opposite, and eventually filling in for, Jennifer Holliday. Working with recording artist Sylvester opened the door for Jeanie to begin her own solo career. Her first album, “Me and You” was released on the Fantasy Label and found her working with Harvey Fuqua. Jeanie appeared on Star Search and placed number one in the Female Vocalist Category for an astounding six weeks. Her Star Search wins made her a household name instantly around the world. Since then, Jeanie has recorded and participated on numerous albums for people like Curtis Mayfield, Celine Dion, Michael Bolton, Tevin Campbell, Kenny Loggins, and Natalie Cole to name a few. 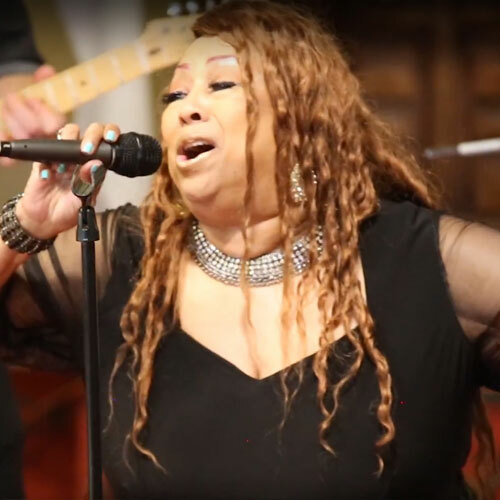 Jeanie was inducted into the Blues Hall of Fame in 2011. oday, with Narada’s Great Gospel Show, she returns to her Church roots and brings her incredible vocal talents to this important show. Jeanie loves to sing and write songs that inspire and motivate people of the world to feel good about themselves and be lifted up.